Are Jewish schools undermining our shuls? Synagogues are being forced to compete for young people’s attention as social environments because that key role is being taken over by the increasing number of Jewish schools. 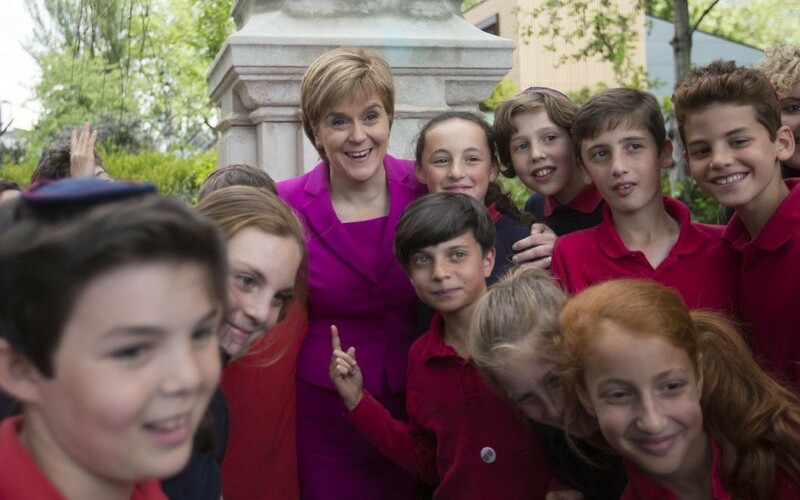 Scottish First Minister Nicola Sturgeon meets pupils from the Independent Jewish Day School. Ambitious plans to open two modern Orthodox Jewish secondary schools in north London have been announced this year. Backers hope that Kedem High and Barkai School will open their doors to students in the next few years. While many parents will understandably breathe a sigh of relief at these developments – Jewish schools are generally oversubscribed and parents in north London, particularly, have expressed concern at the dearth of school spaces – the announcements once again open the debate about the effects the rapid growth of Jewish schools have on the wider community. According to a Strategic Review published by the United Synagogue last year, shuls are now forced to compete with schools in certain situations. “Where synagogues were once the central way for young Jews to socialise with each other, they now meet in school,” it says. Similarly, the Jewish Leadership Council and UJIA released the Commission on Provision for Young People in the Jewish Community report last year, in which they suggest the rise in Jewish schools may have contributed to a decline in youth movement activities. For one mother, who wishes to remain anonymous, these reports come as no surprise. “I send my children to a Jewish school because I want them to have a good education surrounded by like-minded children and families, and to ensure they have a positive Jewish experience,” she says. And looking into the future, she does not see the trend changing. While the sense of identity and belonging Jewish schools give to families is to be praised, the subsequent disengagement with wider communal activities is not what the schools themselves desire. “While the level of observance and engagement will vary between schools, there is a universal objective across schools to enthuse students with a love for their religion,” explains Rabbi David Meyer, executive director of Partnerships for Jewish Schools. “The decision of a parent to send a child to a Jewish school is a significant statement in the family’s Jewish identity and some may feel this means they can reduce engagement in other areas. Indeed Alma Primary School’s headteacher Marc Shoffren believes lessons come alive when put into practice in real life. “There would be no point in teaching reading if the children never picked up a book outside school, or teaching art without the expectation that they would practise it at home or go to an art gallery,” he explains. What is known is that since 2006, eight new Jewish primary schools have opened their doors in north-west London alone, with two more applications currently being considered by the Department for Education. And the number of Jewish pupils enrolled in community schools increased from around 17,000 in the mid-90s to around 26,000 in 2011. David Collins, director of young people and young families at Tribe United Synagogue, recognises the need to respond to this shift. “Our Jewish community is always changing and evolving,” he admits. “The crucial challenge that we must respond to is to be continually looking for opportunities to engage people in whatever way best fits them. From a US perspective, this means recognising there is no ‘one-size-fits-all’ solution. Similarly, the UJIA’s Israel: Get Connected programme, in which 350 Year 12 pupils from four schools participated in an informal Israel education day, is but one new initiative created in response to the changing climate. UJIA’s chief executive, Michael Wegier, concludes: “The Jewish communal landscape is always evolving and the growth of Jewish schools is part of that evolution. “UJIA has worked closely with schools and other organisations to respond and adapt to what our young people need.